I received these Sugar Rush peppers from Jim Duffy at Refining Fire Chiles. They are quite spicy with a fruity flavor that is not unlike the habanero, but not as hot, perhaps as hot as a Cayenne pepper. It had the perfect amount of fruitiness to compliment the tang of a Mexican stiyle green table sauce, which usually have great flavor but are quite low on the heat scale. This version adds a bit of kick to it. Sugar Rush-(Capsicum bacattum) – This is a rare Peach colored Capsicum bacattum variety from Peru that is very sweet. The heat level approaches habanero, but does not quite achieve it. It might be the only Peach colored Aji type we have ever seen. It is similar to the Aji Amarillo but much sweeter, which is why it’s called Sugar Rush. The Sugar Rush Chili plants will grow over 5 feet tall and will need staking. Like many Aji’s they have a long season but produce many peppers into the fall. Preheat oven to 500 degrees, or the broil setting. Toss the garlic cloves in a bit of oil and salt, then wrap loosely in aluminum foil. Set into the oven and bake for a total of 20 minutes. Slice tomatillos and Sugar Rush chili peppers in half lengthwise and set them onto a lightly oiled baking sheet, skin sides up. Set into oven and bake for 12 minutes. Be sure not to get too close to the top heating element or the tops will burn too much. Remove all items from the oven and cool slightly. 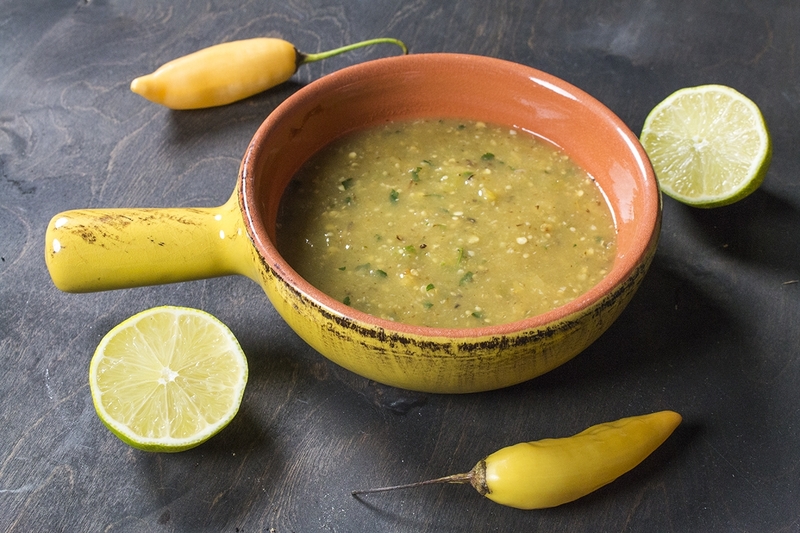 Place tomatillos, chili peppers, cilantro, and lime juice into a food processor. Process until smooth. I like to strain my table sauce a little but so it isn’t quite so chunky, but that is your personal choice. If you strain too much, you’ll be left with a much thinner sauce. I like to have a bit of character in my table sauce.